Have you ever wanted to go to the Moon or Mars? If so Huntsville is a place you need to visit. 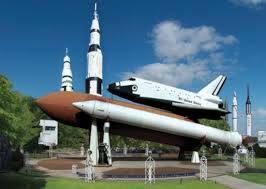 Known as the “The Rocket City” Huntsville Alabama is now one of the “High Tech” centers of the world. The city is on several fastest growing and best places to live list. The city first became known in the early days of the United States Space program. Thy Marshal Space flight center, played a critical role in our quest to reach the moon. After Project Apollo ended, the center took on a major role in the development and testing of the components for the Space Shuttle and the International Space Station. The number 1 attraction in Huntsville is the U.S. Space and Rocket Center. The center is a museum of all things related to space exploration and rockets. From Sputnik to Atlantis and looking into the future of mans quest to travel in space, the center will show you the past and inspire the possibilities we have by stepping of of our Blue Marble. the center piece of the museum is a fully restored Saturn V Rocket. The five massive F-1 engines that powered the first stage greet you as you enter the Davidson Center for Space Exploration, and if you have never been up close to one the sheer scale will awe you. In other ares of the center you can observe trainees at Space Camp learning about space travel. The trainees conduct simulated space mission including space walks. Other things to see and do in Huntsville include the Burritt on the Mountain. In 1955, Dr. Burritt willed his mansion and surrounding 167 acres of land on Round-Top Mountain to the city of Huntsville (making it Huntsville’s first museum). Since that time, volunteers and community activists have brought original homes from the area to Burritt to be restored and utilized as an educational facility. Their interpreters are always busy demonstrating activities as one would see on a 19th century farm. Blacksmithing, spinning, and cooking over an open hearth are just some of the skills employed in this historic park. In the Burritt Barnyard, visitors can get “up close and personal” with an animal that would have been used for work, wool, or even food for the farmers and their families. Take a look at Huntsville wh en you plan your next trip through the South. If you are excited about our future and history in space exploration, this is a place you you must see.